Your hosts Brendan & Kerry Magee will make your stay one that you will never forget. Courtyard Motor Inn is a 3½ star motel conveniently located 900m north of the Post Office at the corner of Wyndham and Lightfoot Street in Shepparton, Victoria. Located 2 hours drive from Melbourne, Shepparton is the perfect spot to stop for a few days of rest and relaxation. Courtyard Motor Inn was established to offer people a budget friendly accommodation that doesn’t compromise comfort, convenience, and safety. It is founded on the principle of providing a home away from home to Shepparton’s visitors. Brendan & Kerry have spent most of their lives in the Shepparton, and love sharing their knowledge with guests. Their warm and inviting style, and their attention to detail is the foundation of Courtyard Motor Inn. They live on the premises & are available outside office hour for emergency situations. 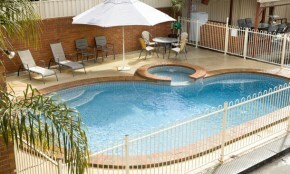 Whether you are travelling for business or leisure, Courtyard Motor Inn is your home away from home in Shepparton. We are strategically located at the heart of the Murray and Goulburn region and in close proximity to the CBD, restaurants, medical centres, sporting facilities, TAFE College, DECA Training, Eastbank Centre, and the RSL Club. At Courtyard Motor Inn, we are committed to give you the best accommodation experience. Your comfort and safety are our top priorities. We take pride in our clean and well appointed rooms. Each room is equipped with amenities that will make your stay more convenient. We have pool and heated outdoor spa, free gas BBQ, and playground which are readily available for your use. 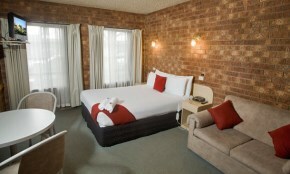 If travelling to Shepparton, come and stay with us. We guarantee a memorable accommodation experience. We are your home away from home in Shepparton. Call us now to book a room. We look forward to serving you!